Q. Do you have information on Eagle boats? In the early months of WWI, President Wilson asked Henry Ford to come to Washington, D.C. in the hope that Ford would serve on the U.S. Shipping Board. While there, Ford and his secretary Ernest Liebold spoke to Edward N. Hurley, the chairman of the board, who told them about the problems that ships were having with German U-boats. Ford, Liebold, and Hurley discussed the possibility of a submarine chaser, the idea spread and gained momentum, until eventually the Navy took over the planning of these vessels later known as the Eagle boat. The Eagle boat was designed by Commander Robert Stocker, Admiral D.W. Taylor, Admiral Griffin, Admiral Dyson, and Commander S.M. Robinson with Ford as an advisor. Ford urged that the hull plates be flat so they could be produced in quantity, and that steam turbines be used instead of reciprocating steam engines. Initially, Ford was not planning on building the boats, but soon found himself agreeing to manufacture 100 boats. On January 14, 1918, Ford Motor Company wrote Secretary Daniels to state that they’d accept a contract to build 100-500 Eagle boats, for a tentative price of $275,000 per vessel, the Government was also to pay for the shipbuilding facilities on the Rouge, estimated at $3,500,000 (which could then be sold to FMC or another company after the war). On January 17, 1918, these terms were accepted with a full contract to come later. When Ford agreed to the contract, the boats were still relatively small but they grew in size as the project went along. Each ship was 200ft long and weighed 550 tons, with single screw, geared steam turbine, oil burning engines. The boats were fitted with 4-inch guns, anti-aircraft guns, machine guns, depth charge projectors, radio equipment, and submarine listening devices. They had a speed of 18 knots and a cruising radius of 3,000 miles. The work site was set for the east bank of Rouge, the stream was widened and dredged, and the first building went up in February 1918. Stretching 18 acres along the river, the site included storage yards, shops, an assembly building, sheds, docks, and a slip and launching platform. The assembly building was designed by Albert Kahn and measured 1700 feet long, 350 feet deep, and 100 feet high, inside were three assembly lines capable of carrying seven boats each. William Knudsen was put in charge of the project, with Ford and Liebold continuing to advise as production went along. 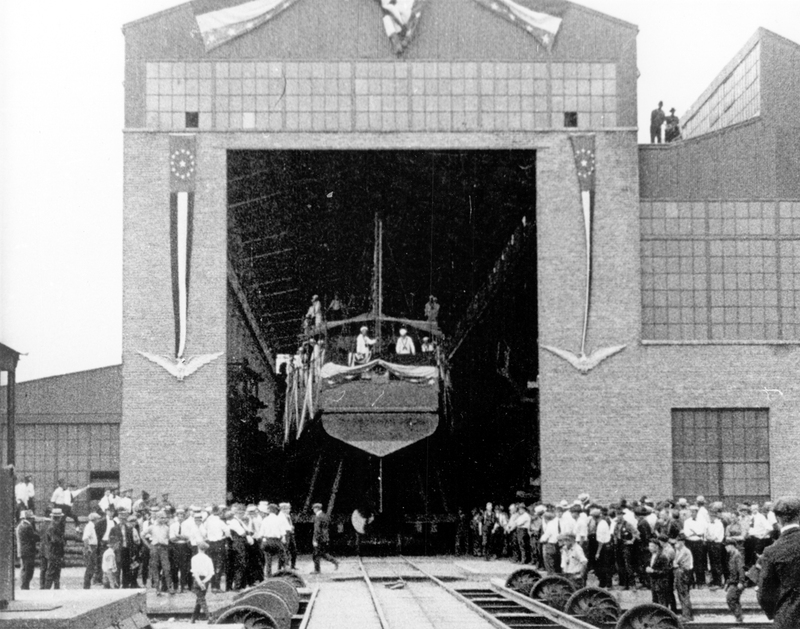 An experimental keel was first laid in Highland Park to test the building procedure, and the first keel was laid at the Rouge in May of 1918. The first Eagle boat was launched on July 11, 1918 via the hydraulic launching platform on the Rouge. 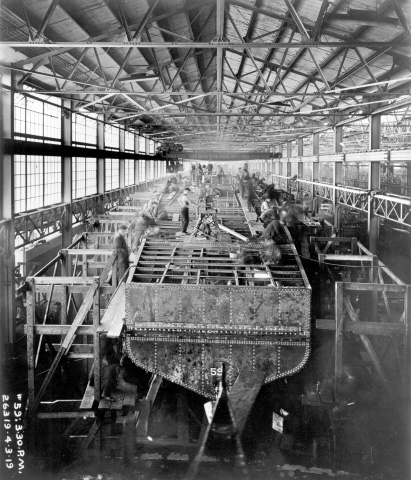 Ford built the boats as factory products using mass production techniques and employing regular factory workers. Though the first boat was completed on time, the ones that followed were not. 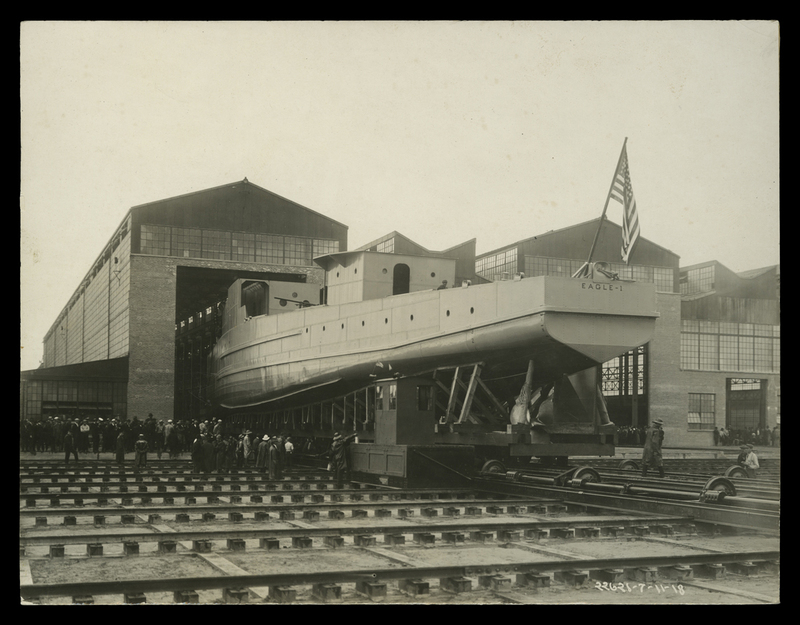 Workers were unfamiliar with naval construction, and few had riveting or welding experience, the company also was unfamiliar with building boats, which slowed down the process and led to some problems. In addition, there was a scarcity of manufacturing materials, difficulty getting workers, lack of worker housing, and because the Rouge was so far from Detroit, difficulty getting workers to and from work (in fact because there was no public transport to Rogue, the company set up Model T trucks with trailers attached to bring men to factory). However, as time went on employment began to rise, with 4,380 workers in July 1918 and peaked at almost 8,000. 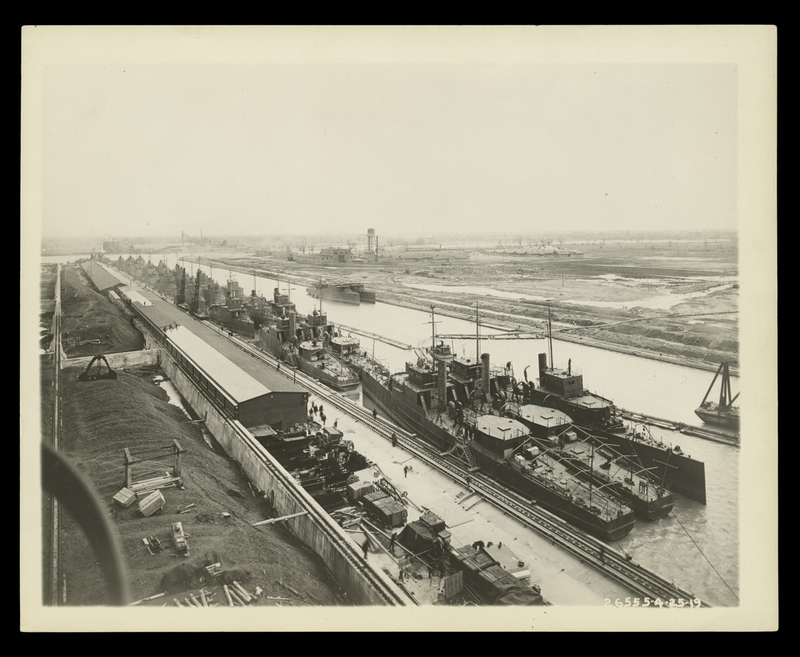 By November 1918, production was picking up and many of the problems had been worked out, however, only seven boats were dispatched before Armistice, and the contract was cut to 60 boats. By January 1919, two boats were being launched each week, the last Eagle boat was launched August 13, 1919. Ford Motor Company completed 60 boats between May 1918 and August 1919. At time of Armistice, 28 keels had been laid, 12 boats launched, and 7 commissioned by the Navy. Some of the first ships saw patrol duty during the war, but few if any were engaged in fighting. Eight saw duty in WWII, and one, no. 56, was sunk. facilities used in connection with construction of patrol boats, etc. Listing of some of the contracts in connection with operations. Folder # 6 Eagle Boats...Supplementary contract re: disposition of Building "B"
Signed by F. D. Roosevelt Acting Secretary of the Navy. Folder # 9 Blueprints of Patrol Boat parts, etc. Engineers and Designers – Kirby, F.E. Winter 1971, v.11, n .1.